The other day my lovely wife Elaine mentioned two very important things. First, it was my night to cook (we generally each cook every other night) and second, we had a lot of sweet peppers that weren’t going to last much longer. Obviously the gauntlet had been dropped. Well anyhow the challenge was there to be taken. This came out so well that I have to share it. The amounts are for a one dish meal for two so adjust as needed. Chop a small onion and one pound of any sweet pepper except green and braise gently about 20 minutes in 2 TBS olive until well cooked and slightly browned. Add 3 TBS pesto, 1/4 cup Kalamata olives (roughly chopped), 1/8 cup capers, 2 cloves garlic sliced thin, 1 tsp black pepper, and 1/4 cup water to the pepper/onion mixture, stir and cook gently. You will want it to mostly dry out before you toss it with the pasta. Cook the fettuccine. and grate some parmesan. Toss cooked fettuccine with sauce and serve in soup bowls garnish with lots of parmesan. Note: If you do not have any pesto laying around 1 TBS dry basil and some chopped walnuts or chopped pine nuts will work just as well. Good food does not have to cost a fortune and food that is good for you can be mighty tasty with minimal effort. 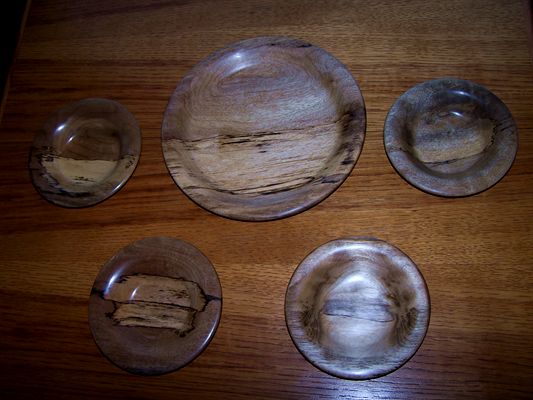 This is an Hors d’oeuvre set I made from spalted Oregon Myrtle wood I found on my summer 2012 trip to the pacific northwest. The serving tray is approximately 10.5 inches and the 4 individual bowls are about 6.25 inches. All are about 1.25 inches deep. I was very pleased with the colors, grain patterns, and shape in this set and hope that other pieces will come out as well. I will have to wait until next winter to see as I am going to the Texas Gulf Coast for December, January, and February. We have also made plans to volunteer on the southern and central Oregon coast this coming summer. We sadly leave the Oregon coast and head inland on the final legs of this summer’s odyssey. A beautiful drive over the mountains through Coquille and Roseburg took us to see our good friends Peggy and Gerry near Medford, Oregon where we were welcomed with open hearts and arms. It was our first visit to their home and again we were blessed with perfect weather. We played cards, chatted, ate, danced, shopped and had a great time being introduced to the area. Our hosts deserve many thanks for the fun times and wonderful memories. Lots of miles on the way home. The first day out of Medford we went down to Mt Shasta and then through Susanville, CA and finally to Border Town, NV. Most of the drive was through the forests with lots of steep grades. The next day we continued on to Reno, NV, Fernley, NV, Fallon, NV, and finally to Beatty, NV. Mostly desolate desert country. From Beatty we continued through Las Vegas, NV and east through Laughlin, NV and finally to Bullhead City, AZ. Highway 68 to Kingman, AZ then I40 east to highways 93 and 60 through Pheonix, AZ to Mesa. We took a break from traveling and spent 1 day shopping in Mesa. Our last day on the road out through Apache Junction, Florence, and Tucson with no stops. I had to turn on the windshield wipers! 7611 miles and we are home. There and back again – a marvelous summer filled with family, friends, places and experiences. Definitely a trip well taken. Above you see my saw table filled with the wood I was given, or I scrounged, and some that I purchased. Oregon myrtle, Maple, Yellowheart, Birch, Alder, Madrone, Myrtle and Maple burls, Cocobolo, Purpleheart, and even some unidentifiable driftwood will be waiting for me to be home long enough to practice woodworking. We will soon be off to the Texas gulf coast for the winter.